In medium-sized pot, bring water, butter, vanilla, and salt to a boil over medium heat. Add the flour all at once and stir until mixture is smooth and forms a doughy ball. Add eggs one at a time and mix until batter is smooth. Drop by large spoonfuls onto a baking sheet. Bake for 30 to 35 minutes or until golden brown and crisp. Remove the puffs from the tray and cool on a rack. Slice with a bread knife, stuff with your favorite filling, and top with your favorite garnish. Makes 6 medium-sized cream puffs. 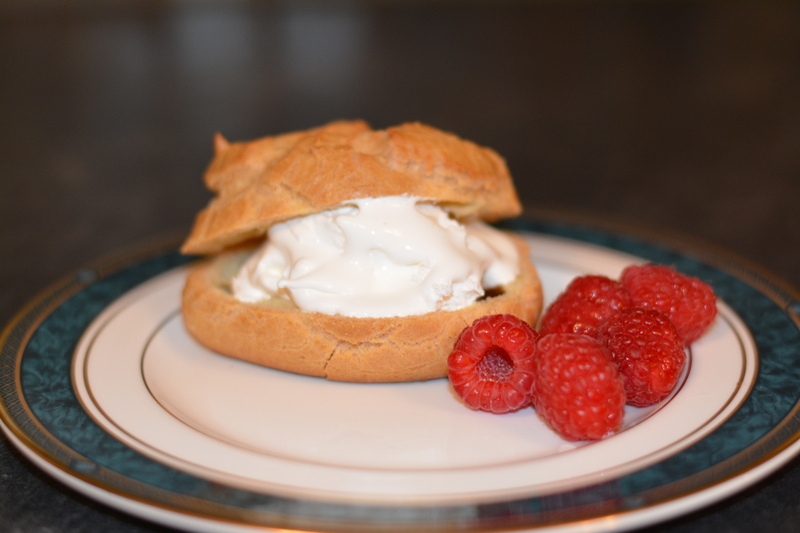 This entry was posted in Baking, Breakfast & Brunch, Drinks & Desserts, Recipes and tagged choux a la creme, GF, gluten free cream puffs, gluten free dessert, gluten free in Red Deer, Gluten-free diet, profiterole, puff pastry, vegetarian. Bookmark the permalink. Thanks for all the times you’ve made them! I am very excited to try this recipe! Thanks! You’re welcome! They are very good! I agree! These were fabulous and easy, and my non-GF friends loved them too. I will definitely be sending this recipe around and would love to write a tribute post on my blog…. Thank you so much. They are fantastic. Glad you enjoyed them! These look fantastic! I can’t wait to try these. Thanks so much. Let me know what you think. Tribute post up on my blog! Thanks again for a wonderful recipe and baking experience! Thanks so much! Made my week! Thank-you – and thanks for coming by! Thank you for dropping by my blog Help! My Teenager has Coeliac Disease, which has lead me to your site and your wonderful and practical recipes. The Macaroni Cheese and the Cream Puffs will be on the menu this weekend. I look forward to exploring more of your recipes. Thank you so much. And thanks also for dropping by. Mmm can’t wait to try these ! Just made this. WOW! A-M-A-Z-I-N-G! I changed it a little subbing arrowroot flour for rice and coconut oil instead of butter, But I’m LOVING these! It’s going to be posted on my blog by tomorrow, I guarantee! Thanks so much! So glad you enjoyed them! I must try these – I really miss being able to eat profiteroles and these look like they might just do the job. They really are good! Enjoy! As always – delicious and decadent! Thanks Laura. Always nice to hear from you. These look really good. I’m thinking about doing Easter Brunch this year and have already started looking for new and different ideas for the meal. These look light and I could tint the filling a nice pastel for a pop of color. This looks fantastic!! I cannot wait to make these!!!! I find that Choux Pastry from gluten free mixes or flours produces puffs or éclairs more delicate that from wheat flour. Flexibility of the filling and no sugar in the pastry makes them a perfect desert for every taste. They look great! I wish you cooked for me. Your guy is very lucky. Thanks so much. We don’t always eat like this 🙂 Usually we make the really decadent things when we’re entertaining. That’s very strange. I have never used coconut oil, so I don’t know if that would make the difference. I have had them fall on me if I open the oven door for too long. Those, though, I can usually plump by filling them with cream. So sorry they didn’t turn out. Hope you try it again because they are really, really tasty. Not scoopable like a cookie but more like a thick and sticky batter. I usually spread the batter out just a bit with a spoon. Wowzer. This looks incredibly inexpensive recipe, as well. If you don’t mind, I’d like to do the recipe with Asian rice flour (very cheap) and homemade coconut milk ice cream. Thanks so much for posting this! That sounds great. And you’re right – for a gluten free food, this is very inexpensive to do. OMG, I have to do this. I hadn’t even thought it might be possible to make GF cream puffs. I’d want to make custard for the filling, since to me that’s the best part of cream puffs, but this sounds amazing for the outside. Custard …. mmmmmmm. Sounds fantastic. I made these today for my parents & coeliac sister. They were excellent & so easy! Thanks! I don’t think they would have known they were gf, the texture is great. Thanks Tina. One of our oldest and best gf recipes. Glad you enjoyed them!